RNA-Seq reveals roles for SETD8 in stem cell maintenance, proliferation, and metastatic pathways. 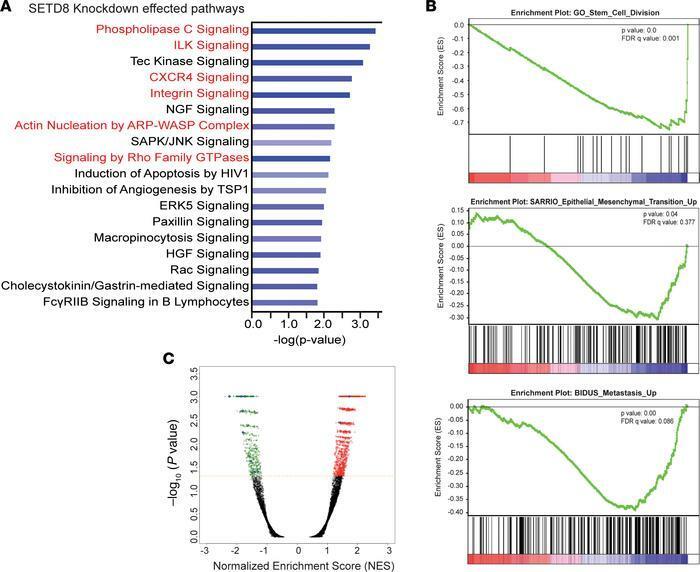 (A) The top pathways from Ingenuity Pathway Analysis effected by SETD8 knockdown. Bars represent significance of gene enrichment for a given pathway on a –log10(P value) scale. Select pathways are highlighted in red. (B) GSEA D458 shNull vs. shSETD8 RNA-Seq. FDR q value and P value are shown for each plot. Negative enrichment of gene sets involved stem cell maintenance, EMT, metastasis. (C) Volcano plot of normalized enrichment score vs. –log10(P value) for genesets effected by knockdown of SETD8 in D458 cells. Selected genesets are highlighted in blue. See also Supplemental Figure 3.